Summers are double fun if boating and camping are part of your vacation plans. 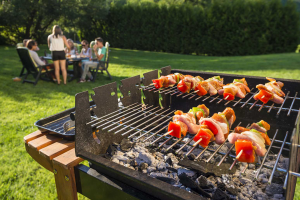 Outdoor activities with games and music are even better when the food is grilled and served hot. To make your boating experience extra special, we present to you some of the best grills for boating. These grills are designed and manufactured to be used while boating and give superb results. Size: To find the right size grill, you must also identify how many persons your boat will hold. A large sized grill will take extra space of your boat and a smaller grill will require you to keep cooking till everyone is served. Ideally, a grill that caters to 4-5 persons is considered as the most appropriate size. Grill Frames: whenever you buy a grill for boating, don’t forget to consider the weather and marine conditions. Make sure you buy frames and housings that are made up of polished seams and double-lined stainless hood to remain sturdy and durable to be used for years. Boat Mounting: You will need to decide if you want to mount the grill on your boat more permanently or go with something more flexible that can be used on a boat or off boat. Warranty: Grills are made up of heavy, high-quality material and attachments that may not be available easily in the market. Some grills don’t even fit into universal attachments; therefore it is highly recommended that you buy a grill that offers you a 3-5 year warranty. If you are looking for a simple grill, one that isn’t hard on your budget and works well for searing and grilling, Magma Marine Kettle Gas Grill is a valid choice. Made of mirror polished stainless steel, it features a radiant plate heat distribution system and convection heating technology to get the hot temperature. It also features a swivel, windproof turbo venturi, and control valve to reduce blowouts. It is designed to keep the entire grilling experience simple, safe and convenient. Magma offers a wide range of mounting options and accessories for customization. Magma takes less space and its elegant design adds exclusivity to boats and outdoor places. This may look like a small grill, but don’t judge it only by its size. It’s portable, light in weight yet sufficient to cook a family meal. Featuring a twist-start ignition, it is solid, durable and very easy to set-up anywhere around. With 3 different colors, this grill also includes a stand, tabletop and an integrated lid lock for safe and easy grilling. It can make space for eight smaller steaks, four pounds of fish and approximately eight chicken breasts. The Cuisinart CGG-180T features a stainless steel burner, a porcelain-enameled grate and can very efficiently accommodate high temperatures. The firm aluminum legs are suitable for uneven boat surfaces and remain sturdy. Kumma Grills are specially designed for boating, RVing, Tailgating and patio grilling. They are built to tolerate harsh weather and marine environment, therefore, survives longer than other boating grills. With its spacious grilling area, (almost 160 sq. inches) it can easily cook, grill, sear for 4-5 persons. Kuuma’s additional features include integrated foldaway legs, a latching lid, removable liner, and cool handle, allowing you to do safe and secure grilling on any surface and any kind of boat. Kumma is a portable and conveniently maneuverable grill that can easily be mounted to any rail, rod or pedestal mount. Arnall’s Pontoon Grill combined with the Cuisinart Grill may not be a fancy addition to your boating experience, but it has all that you need to eat grilled fish, chicken, and burgers on your boat. It is made up of solid zinc electro-plated steal that won’t rust easily. Highly portable and easily movable, you can mount the grill set on your 1.25-inch railing and be creative with your boating meals. The set includes hardware, attachments with illustrations for easy mounting. Arnall is a very solid and durable choice at a reasonable price. If you can compromise on its appearance, you will be satisfied with its efficiency. This is a standing boating grill that requires no mounting of drilling. It features a built-in regulator tank, a deck mount and thread-lock two-piece pedestal that can fit inside the grill or used as a standing table top. Unlike other grills, Springfield has sufficient grilling/cooking space to cater to a family or more. It looks pleasant and classy so you can very confidently place it on your boat. It also makes premium quality hardware, making it durable for the marine environment. The Coleman Perfect Flow Propane Camp Grill is one of the excellent boating grills you would find in the market. It features Perfect Flow technology that ensures less fuel consumption and high performance in the toughest weather conditions. Unlike other grills that complain of winds blowing the gas, Coleman has wind block panels that protect burners from winds and can later be used as side-tables. the removable grease management tray spills less, removes easily and cleans in no time. Spacious, durable and hassle-free is what you can name Coleman as. This is a spacious, portable and durable stainless-steel grill that double your camping, boating and tailgating double fun with delicious and hot grilled food. It features a deep grill dish and extended foldable legs to accommodate to almost all kinds of boats. For safe and even grilling it also included a latching lid and a stay-cool handle. Unlike other grills, Camco also provides a thermometer to monitor and adjust the grilling temperature. It is easy to set-up and starts with a push-button igniter. All in all, Camco is a fair price deal with all the necessary features you want in a grill. Includes a weather resistant polyester made storage bag. Gas regulation gives away an awful smell. All the above grill options are some of the best grills available in the market with premium quality material and attachments. There are many options from free standing to options that are attached to your boat. Be sure to check out all the feature and select the best grill for your boating fun!